From odds and ends of discarded equipment 13-year-old Franklin Lee has built a remarkably complete scientific laboratory. A few of his many successful electrical projects are described in this article. NIMBLE fingers, an inventive mind, and. the urge to experiment have brought to 13-year-old Franklin Lee, Granite Falls, Minn., electronic wizard, a scientific research laboratory that would do credit to a college student of science. In the well-lighted interior of his garage workshop powerful homemade electric motors turn lathes and grindstones. Standing by in one corner, ready for instant use, is an electromagnet capable of lifting a hundred pounds. Transformers of different sizes and voltages hum merrily in their baths of cooling oil, while in one corner metal glows white-hot in a homemade electric arc furnace. From discarded electrical equipment, auto parts, and odds and ends of cast-away materials Franklin built them all. But Minnesota’s “boy-Edison” is not strictly a scholarly type of boy. Invading nearby dumps and junk piles, he salvaged scraps for possible future use. Electrical devices, given to him by friends, were dismantled for the wire, bolts, nuts and screws. After completing and testing each electrical gadget, the youth would tear it down and build other experimental apparatus. 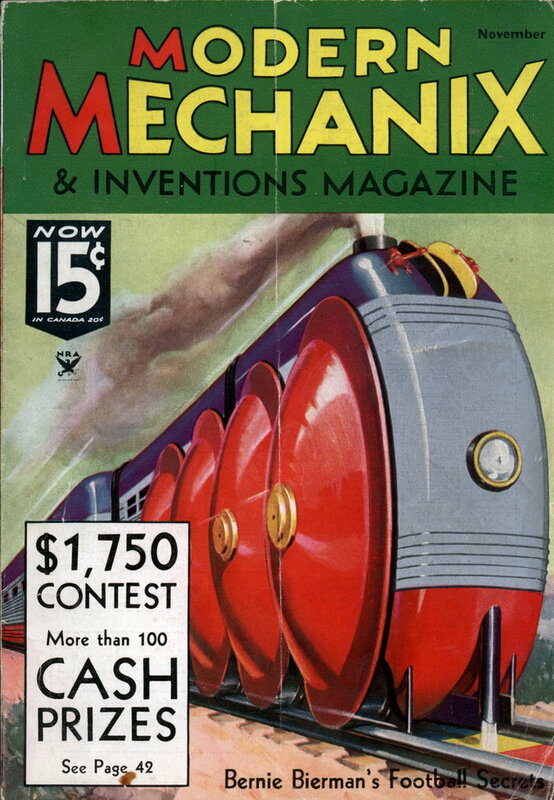 At ten, Franklin built his first successful motor. Plenty of odds and ends went into the motorâ€”watch parts, discarded scrap iron, a knitting needle for a shaft. He had to splice together short lengths of wire for the windings. The motor was of makeshift design, but it worked. Many of Franklin’s projects were far from mechanically perfect since he labored under difficulties, utilizing only the materials on hand. Everything that he has done or built, however, has been successful because he understands principles. Franklin’s collection of workshop tools grew as a reward for his hard work. Christmas and birthday gifts usually meant tools and new shop equipment. These he has mounted in appropriate racks along the walls. When visitors call, he is unaware of their presence. He has had a number of helpers, but none seem to be able to follow his pace. The work is either too difficult, too dirty or too tiresome to interest his young friends. 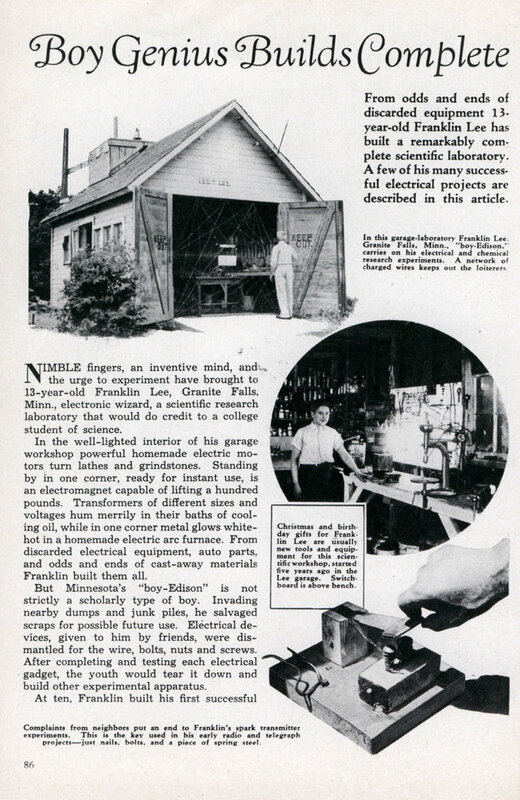 To ward off bothersome youngsters or curiosity-seekers, Franklin has covered the garage opening with a network of wire and hung up “Dangerâ€”High Voltage” signs. When the proper switch is thrown, those who touch the wires in trying to enter receive an unpleasant shock. On the roof of the garage-laboratory is set up a powerful searchlight, one of several built from odd parts. The wooden base revolves on the shaft of an old car generator. Carbons removed from discarded flashlight batteries are used in the arcs. The reflector is from an auto headlight, but the collector rings, the carbon holders and other parts were designed in the boy’s workshop. One night when he and several friends mounted a homemade searchlight atop the Granite Falls courthouse, residents ten miles away saw the beam. He recently tore down several burned-out transformers, reconstructing three larger ones with differing voltages and amperages which are housed in tall crocks and discarded jars filled with oil. These transformers proved so efficient that he has used them consistently in laboratory experiments. Franklin has made three complete electric motors and has rebuilt two commercial motors, one of which runs a tiny lathe. His most recent motor, requiring nearly a summer to assemble, weighs 30 pounds and has interchangeable armatures with sufficient power to spin a grindstone. A simple homemade rheostat, built into a wooden crate, regulates the speed. Some of the more recent projects include arc lights, arc furnaces, spectrum testers and static machines. All of the switches, condensers and circuit breakers which he uses are products of his versatile mind and stubby fingers. Scores of second-hand books, filling the shelves at the rear of the laboratory, make up a complete university science library. Just across the room are more shelves, lined with bottles of chemicals, flasks, and chemical apparatus. While delving into advanced chemistry, Franklin has built his own carbon arc furnaces. The young scientist is quiet, unassuming, but with an inquisitive turn of mind. Research is his chief interest, but long hikes through the countryside and experiments with tree-grafting are other hobbies. “What subjects are you particularly interested in, Franklin?” he was once asked.